There is increasing interest in adding mineral content back into reverse osmosis water. Raising the mineral content also raises the pH, and according to many, improves the taste of low-pH RO water. This can be accomplished easily by adding a simple post-filter containing Calcite or Calcite combined with a small amount of Corosex (aka FlowMag). 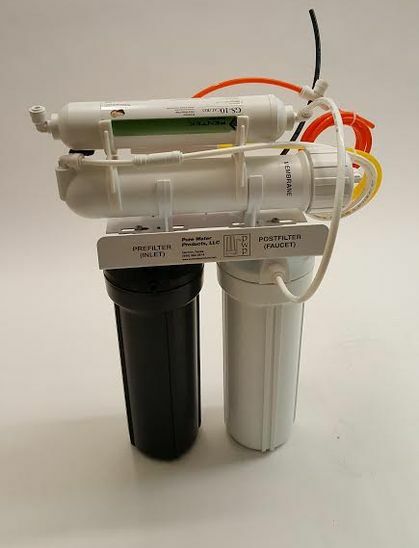 Both are standard water treatment minerals available in NSF Standard 60 brands that are regularly used to raise pH of acidic well water and as post treatment for “whole house” reverse osmosis units. Calcite is natural calcium carbonate made from crushed granite and FlowMag is magnesium oxide. They add back to the water natural calcium and magnesium plus whatever trace minerals are present in the natural sources. The picture above shows the easiest way to add a calcite filter. The inline filter on the very top is a Calcite/coconut-shell carbon postfilter added after the unit’s regular post filter (white housing). It provides some extra carbon, a bump in pH, and added minerals. It makes excellent tasting water, is inexpensive, and is easy to replace. Total cost of the cartridge, the clips to hold it, and the fittings is around $30. Another way to add a remineralizing stage to your existing RO unit is to add a free-standing full-sized Calcite/Corosex cartridge after your present post filter. With this method you simply add the remineralizing filter into your faucet line, between the current post-filter and the faucet. The remineralizing unit shown below connects easily with quick connect fittings in the same size as your present faucet line. 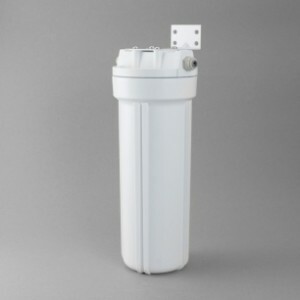 Round number cost of adding the free-standing add-on calcite filter, for filter, bracket, fittings and one cartridge, is about $60.